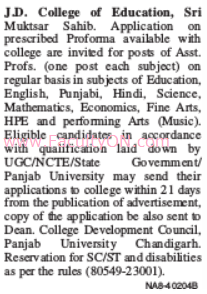 J.D.College of Education, Muktsar has advertised in the TRIBUNE newspaper for the recruitment of Teaching Faculty- Assistant Professor jobs vacancies. Interested and eligible job aspirants are requested to apply within 21 days from 27th September 2018. Check out further more details below. About College: J.D. College of Education is situated in Muktsar in Punjab state of India. The college has been established in 2005 and it is accredited from NCTE and also it is affiliated to Panjab University. JDCE, Muktsar offers 2 courses across 1 streams namely Education and across 2 degrees like B.Ed, Diploma. JDCE campus is spread over 13 Acres. Hostel facility is not available for its students.